The first IFSA-Butler weekend trip was to the Medieval Capitol of Ireland — Kilkenny. Known for its ancient buildings, regal castles, and hurling. I took in the sights and the culture during this fun and ghost-filled excursion. The weekend began with a hurling lesson! Hurling is a uniquely Irish sport where you use sticks to wack a baseball sized cork ball around and hope to score either a field goal or a full goal into a soccer-style net. I was not the best nor was I the worst, so the morning was a success. After hurling, some of the IFSA gals and I explored the town. This picture is from the top of a medieval monastery’s tower (it was not built as a safety measure, but as a symbol of the church’s power). Before heading back to Dublin the next morning, we toured the 18th Century Castle in the centre of town. It was completely restored and absolutely beautiful. My favourite room was the Drawing Room, complete with on-trend mustard wallpaper and many a leather-bound book. After our tour, we concluded our whimsical weekend and travelled back to UCD. Bonus anecdote! Whilst taking in the local nightlife culture, I was scolded by a bouncer for wearing Adidas track pants to the club! What a craic-filled night it was. In Ireland, Halloween is known as Samhain, a Celtic holiday celebrating the harvest. Alas, I did not harvest any crops, but I did go on a haunted bus ride, complete with creepy grave yards and a questionably professional tour guide, and dressed up in two semi-obscure costumes. It was a grand time filled with spook and awe. Halloween was sandwiched between two marvellous weekends spent with Missy and Nick: parents to the stars. The first weekend we travelled to Galway. We perused the local pubs and toured the Burren and Cliffs of Moher, an extremely famous UNESCO Heritage Site where Melissa spent most of the time worrying whether Nick and I were going to tumble off the cliff. The second weekend we went to many Dublin Museums and the Temple Bar district. It was a really fun time to get my mind off school and feel a bit more at home. We ate many good meals, drank pints of Guinness, and took in the beautiful cities of Galway and Dublin — although I am pretty sure my parents enjoyed their time (without me) in Dingle the most of all. Once November rolled around, there was a slight nip in the air and the Christmas Spirit began rapidly spreading throughout campus. Reading Week came and went and I desperately needed a reprieve from the monotony of campus life. Luckily, the second IFSA-Butler trip, this time to Northern Ireland, came at the exact right time. On Friday, we toured the North Coast. The wind was too harsh to visit the Carrick-A-Rede Rope Bridge, but we still saw The Giant’s Causeway, Dunluce Castle, and The Dark Hedges (aka The King’s Road from “Game of Thrones”). The next day we took the Black Cab Tour where we learned about The Troubles of the 1970s-1990s. It was a very interesting tour where we heard from both Catholic and Protestant taxi drivers. Although their accounts were deeply dramatised, it was amazing to see how far the city of Belfast has progressed since the Good Friday Peace Agreement in 1998. Perhaps the best part of the weekend was getting to see Ellen again! She drove up from Portadown for the day and we went shopping and got coffee to catch up. Last weekend, Kira (a friend from the program) and I travelled to Venice for a weekend of pasta, Aperol Spritz, and awe-inducing sights. We began our trip with a lovely lunch and a walkthrough the meandering streets of Venice. The architecture of the buildings render even the dingiest of buildings looking regal and the lack of cars made me feel like I was stepping back in time. One day, we travelled to Verona, home of the infamous star crossed lovers Romeo and Juliet. The city is surprisingly modern with lots of upscale shopping and restaurants. We visited Juliet’s house and her iconic balcony. 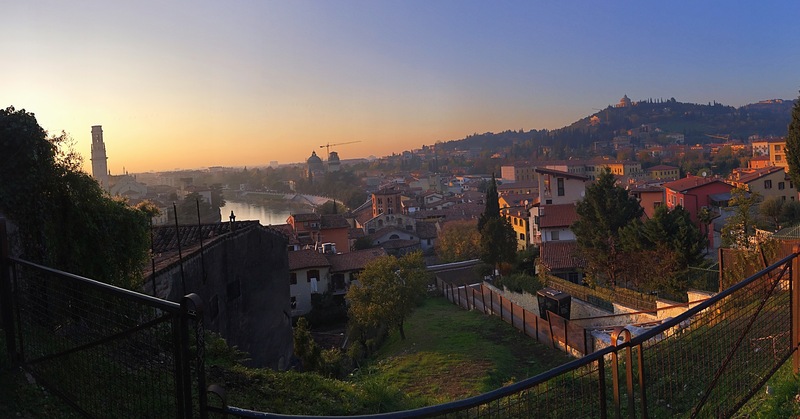 We also climbed a big hill to watch the sun set over Verona, it was astonishing. It’s hard to explain just how beautiful these two cities are, so I’ll just leave my mediocre photos as a substitute. Bonus Anecdote! As our pane back to Dublin flew away from our weekend escape, we went over the snow-covered Alps. It was so, so cool. Well, that’s the Top 5 rundown. I’ll be back in a few weeks to share more about my impending exams and upcoming travels. Thanks for the cultural updates! Should this be the last thing I see?